Israeli settlement plans in a strategically sensitive area of occupied land near East Jerusalem would deal "an almost fatal blow" to peace hopes, UN head Ban Ki-moon has warned. Palestinians in East Jerusalem could be completely cut off from the rest of the West Bank, he said. Israel authorised 3,000 additional housing units a day after the UN voted to upgrade Palestinian status. On Monday, the UK summoned the Israeli envoy to express its concerns. The UK Foreign Office said Israel should expect a "strong reaction" if it went ahead with its plans. The UN General Assembly backed a proposal last Thursday by Palestinian Authority President Mahmoud Abbas to change the Palestinians' status at the UN to that of non-member observer state. In a statement on Sunday, Mr Ban expressed "grave concern and disappointment" over the 3,000 newly authorised Israeli settlement units in East Jerusalem and the West Bank. Media captionIsraeli PM Benjamin Netanyahu: "We will continue building in Jerusalem and anywhere on Israel's strategic map"
But he was most adamant that any plans to build in the so-called E1 area - between Jerusalem and the West Bank settlement of Maaleh Adumim - should be rescinded. 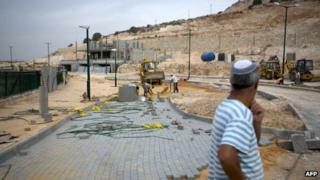 An Israeli official has described the proposals in the E1 zone as "preliminary zoning and planning work". "It would represent an almost fatal blow to remaining chances of securing a two-state solution," Mr Ban said. The UK said it was urging Israel to reconsider the settlements plan, saying it "threatens the two state solution and makes progress through negotiations harder to achieve". Agence France-Presse quoted an Israeli embassy spokesman in Paris as saying that the ambassador there had also been summoned over the issue. The US said earlier the expansion plan was counter-productive and would make it harder to resume peace talks, and EU foreign policy chief Catherine Ashton said she was "extremely worried" by prospects of large-scale construction. Mahmoud Abbas has called for an end to settlement building and a return to peace talks. Returning from New York on Sunday, he told thousands of flag-waving supporters in Ramallah: "Now we have a state." At a meeting on Sunday of the Israeli cabinet, Prime Minister Benjamin Netanyahu condemned the Palestinian campaign as a "gross violation" of previous agreements with Israel. And he also brushed off international criticism of Israel's settlement plans. "We will carry on building in Jerusalem and in all the places that are on the map of Israel's strategic interests," he added. Plans for construction in the E1 envelope are strongly opposed by Palestinians, who say such development will prevent the creation of a contiguous Palestinian state. The Israeli announcement of its settlement plans was a first indication of Israeli anger, less than 24 hours after the vote on Palestinian status was held at the UN, the BBC's Kevin Connolly in Jerusalem says. In a separate development, the Israeli government also said that it would be stopping a $100m (£62m) transfer of tax revenues that it collected on behalf of the Palestinian Authority. Israel said it was because the Palestinians had not settled a $200m debt to an Israeli electricity firm. However, Israeli Finance Minister Yuval Steinitz warned last month that if the Palestinians went ahead with the UN bid Israel would "not collect taxes for them and we will not transfer their revenues". About 500,000 Jews live in more than 100 settlements built since the occupation of the West Bank and East Jerusalem. Two decades of on-off negotiations between Israel and the Palestinian Authority have failed to produce a permanent settlement, with the latest round of direct negotiations breaking down in 2010. Is UN vote more than symbolic?